Another great budget month! We made $3,468.74, and spent $2843.41, for a net of $625.33. 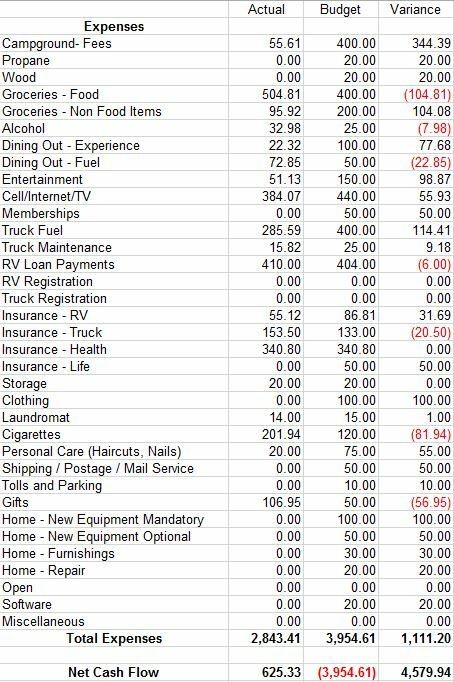 From a pure cash flow perspective we spent more because we prepaid three weeks of April campground fees, but we are tracking those in the month the stays occur, so they will show up in April. We also paid taxes, but since that amount was roughly the return we got last year and was set aside in a separate account that was a wash. The details are listed below. By the way, April 15th will be one year since we have supported ourselves exclusively through our various work kamping efforts, and I will be doing another post on how the 12 month period went. I was going to include it here but I think it deserves it’s own summary. Campground Fees – Just a couple of nights when we left our oilfield gate. Alcohol – Stocked up in anticipation of being with our friends. We are almost always under in this category so not a big deal going over $8 one month. Dining Out – We were about $50 to the good overall. I got lazy at the end and we grabbed fast food here and there, and then I bought some Church’s chicken for travel days. Entertainment – Lee bought a couple of computer games and I bought some music. I usually only buy it when The Voice is on (big fan of that show). RV Insurance – They over charged us a couple months ago (it’s auto deducted) so they have been taking out less making that up. Cigarettes – We have been buying tobacco and tubes in bulk since the summer, so this is three months worth. Gifts – I spent $200 on the one-on-one session with my favorite author. $100 of that my father gave me as a Christmas gift so I put the other $100 in the gift category. I could have put it in entertainment, I guess, but it felt right going here. Home Repair – We spent nothing in this category which is a huge deal. Last year we were routinely spending $200 or more per month in this category but Lee has really focused on this. We were going to replace our Vornado fan , but couldn’t find one locally so decided to wait until we reached Phoenix and pick one up there. It was another good month from a budget perspective. We will see what happens in April since we will be moving so much, staying in campgrounds, and hanging out with friends. This entry was posted in Lakeside and tagged Full Time RV Budget. Bookmark the permalink. It’s always a good feeling to come in under budget! Have a great time visiting with your friends!